Designed specifically for first floor living, most of the time, this brick patio-like home features a master suite and additional room for a den or office on the first floor. 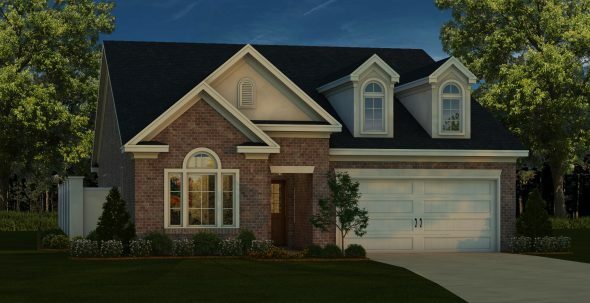 As you enter the covered porch into the formal foyer, you’ll admire the stunning hardwood floors, custom moldings, and flex room with French doors and dramatic high ceiling. To maximize entertainment areas, the only separation between the main living areas is detail work on the ceilings. The kitchen features luxury stainless steel appliances including gas cooktop, huge granite-topped island that seats four, and plenty of custom cabinets including a custom cabinet pantry area for maximum storage space and elegance. The dining room features a large double window for natural light as well as a large wall for that treasured piece of furniture. The family room is graciously open to both the dining and kitchen, and features a gas fireplace with decorative mantle and large scenic window overlooking the outside living area. The laundry room is located on the main floor off the owners’ entry, which features drop zone for convenience. The master bedroom features another large scenic window overlooking the outside living area and door separating the bedroom from the bathroom for privacy. The master bath features 2 walk-in closets, water closet, corner soaking tub, separate vanities, tile shower, and linen closet Upstairs you’ll find 2 additional bedrooms, loft, and large walk-in attic space for storage.